Natural Body Scrub Recipes That Will Have Your Skin Smooth, Silky And Fresh Looking! Body scrub recipes are super quick to whip up, inexpensive and work better than any commercial body scrub out there. They are gentle on your skin but very effective at exfoliating, smoothing and nourishing. Use these recipes once or twice a week but no more than that. Any more and you could strip and damage your skin. Once you feel your skin after one of these treatments you will be hooked! When using your body scrub work in small circular motions and be very gentle so you don't damage your skin. This is why sugar makes such a good exfoliater, it is very gentle and dissolves before you can over wash with it. Enjoy these natural body scrub recipes! Mix brown sugar and oils together. Puncture Vitamin E capsules and add to mixture. Mix well. Warm honey and then add the rest of the ingredients. Mix into a paste. Warm honey and then add the rest of ingredients. Mix until it forms a paste. Get rid of dull, rough skin and realize your skin's natural beauty! 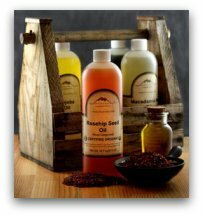 To purchase natural body scrub supplies, below are quick links to all the ingredients in the above recipes.